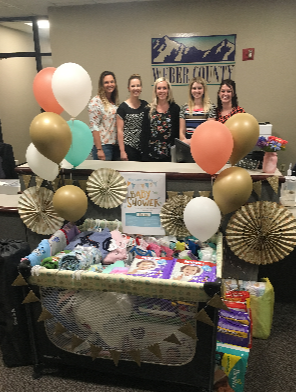 A Community Baby Shower is just that—baby gifts and supplies donated from the community and then given back to those in need in the community. During the month of April, we are reaching out to our neighbors and asking people to host a baby shower with their friends, family, clubs, church groups, or offices. We will even provide you with a baby shower kit that includes invitations, shower games, suggestions for refreshments, and small party favors. You can organize the shower to fit your schedule, and bring donations to our office during business hours. To request your free baby shower kit, email Julie Johnson or call our office at 801-399-5584. --Baby toys - rattles, teething rings, etc. Welcome Baby is a free community outreach program sponsored by United Way of Northern Utah. Volunteers visit moms monthly with age-appropriate developmental information, activity ideas, and parenting tips. Most moms develop a relationship with their home visitor and feel comfortable texting or calling them when they have a question or need advice. Welcome Baby has been fortunate in receiving generous donations from the community. On the first visit, moms receive a diaper bag filled with new baby essentials—diapers, wipes, baby outfit, blanket, digital thermometer, board books, and a parenting guidebook. Volunteers are able to take much-needed baby items such as diapers and wipes into the homes on their monthly visits. These moms are so grateful, some even moved to tears, for the items they receive. For some, these are things they could not afford otherwise. Welcome Baby currently has 24 visitor volunteers who make monthly home visits. We currently have just over 160 families participating in the program. We are growing at a rate of 5–6 new families every month. We visit babies from birth to 36 months of age. We currently service all of Weber County, expanding soon to Box Elder County. Welcome Baby partners with several agencies for family referrals into our program, offering much-needed support to these families. Any extra donations that are not used for the families in our program are given to other community programs that serve families with babies.